This reunion has been ten years in the making. I originally bought this frame while still in college back in 1999/2000, can't quite remember. 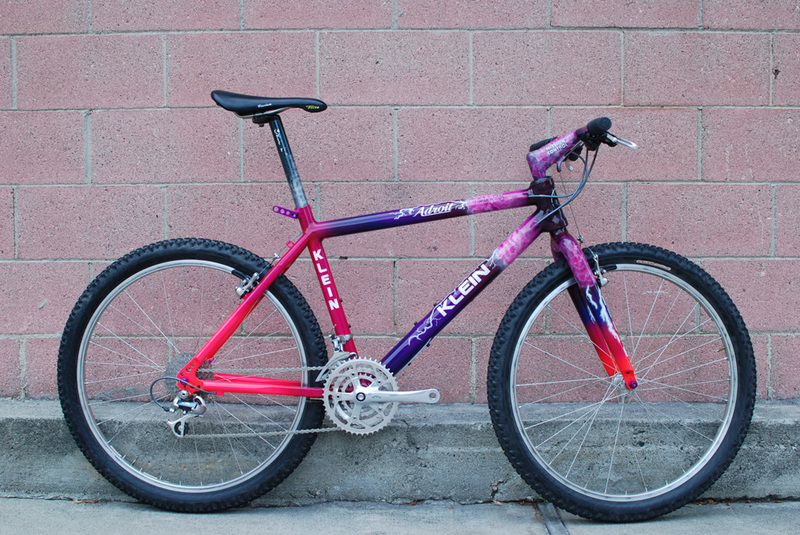 The story goes; bike was being sold by a bike mechanic turned DJ from Seattle who claimed to have been Tinker's mechanic while he raced for Klein. 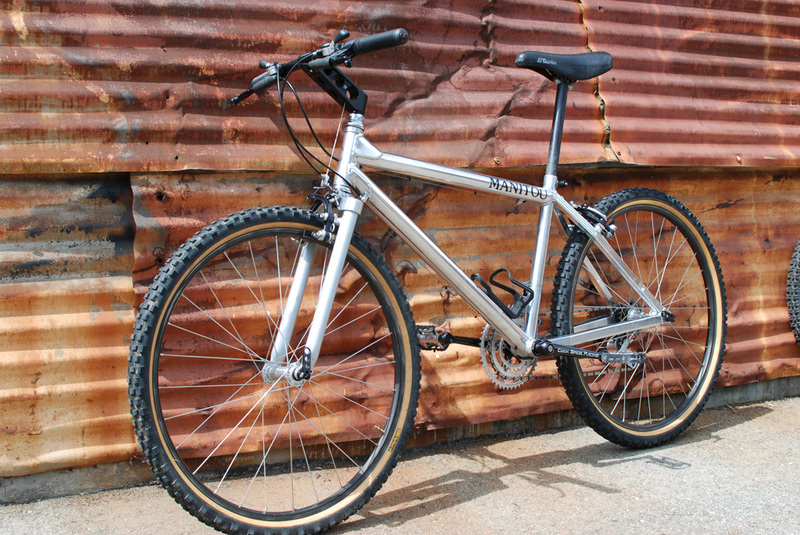 The seller 'claimed' that this was Tinker's back up race bike and was never used. 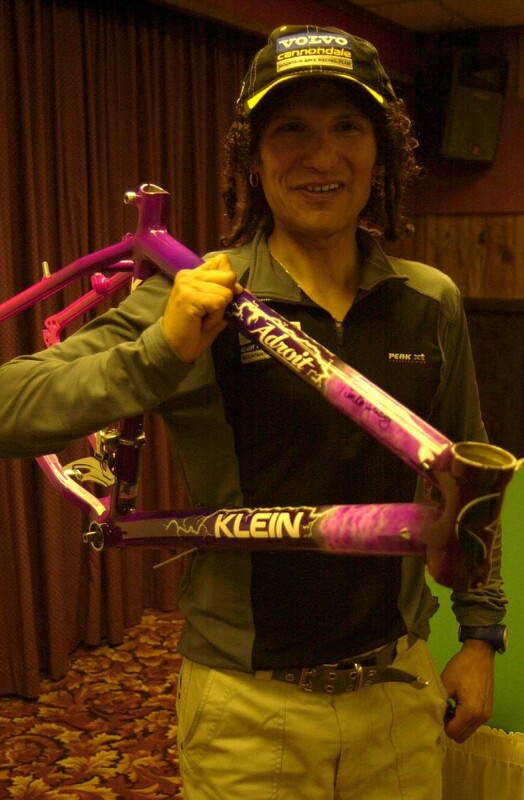 Once his last season with Klein ended he gave the frame to some bike shop in Seattle where this guy ended up working as a full time mechanic. It hung there for several years until the owner either gave it to or this guy bought it from them with the hopes of building it up. He found a fork for it (MC2 fork) and started to work on it but never got very far. 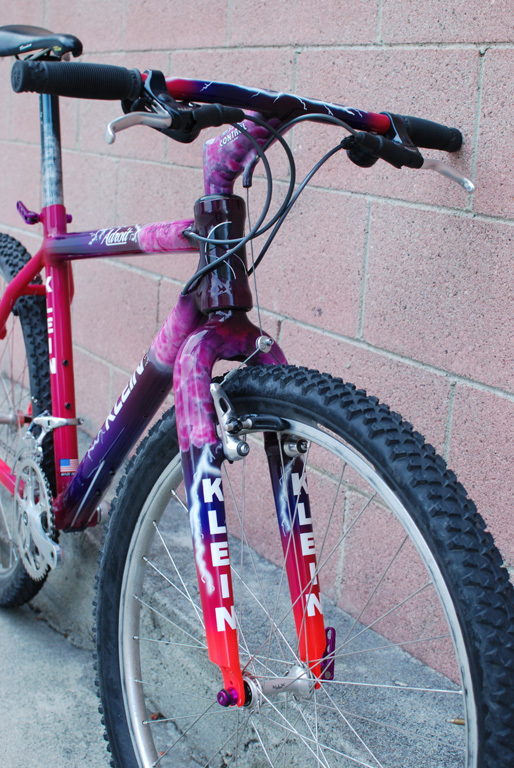 Now, I took the bike to the Klein factory, talked to the painters (Dale, Kory and others) and nobody really had any good insight, or couldn't remember. 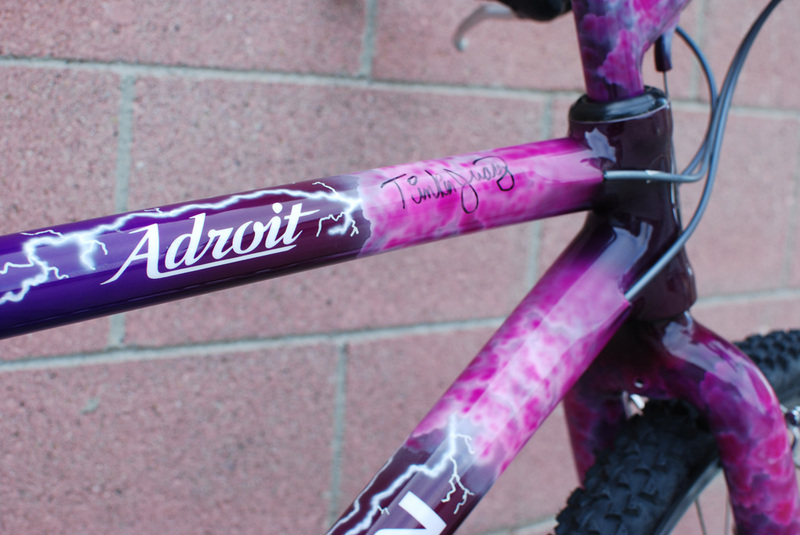 The frame is not signed which everybody said meant that Dale painted it since they all took so much pride in those paintjobs that they signed them. More than likely this was an early attempt at the Storm paintjob while Dale was developing it. 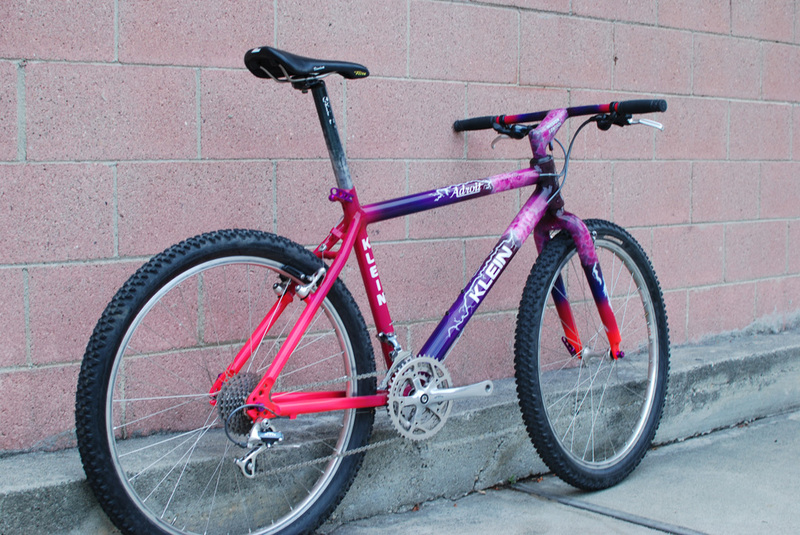 We all know that the final team bikes had clouds starting on the headtube (on mine they start on the top and seat tubes), the the multi color fade starting with black/purple/pink (orange drops on the team bikes). 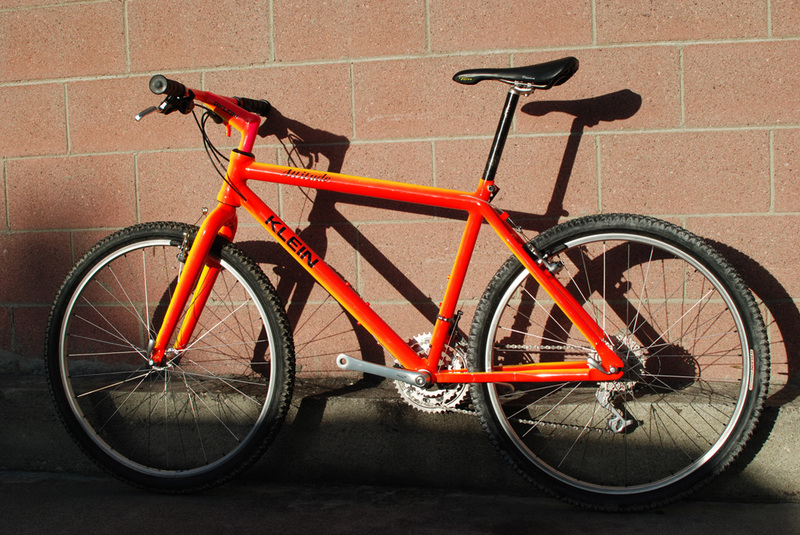 So this bike lacks the clouds on the headtube and the orange on the dropouts. I'm fairly certain that it was either bike meant for a team rider that never got it, or maybe it was just an experiment that never got fully cooked. The other interesting tid bits are a 4th set of water bottle mounts which is rather uncommon for a normal Klein and the Ti brake bosses and BB spindle (something I've mostly seen on race bikes). 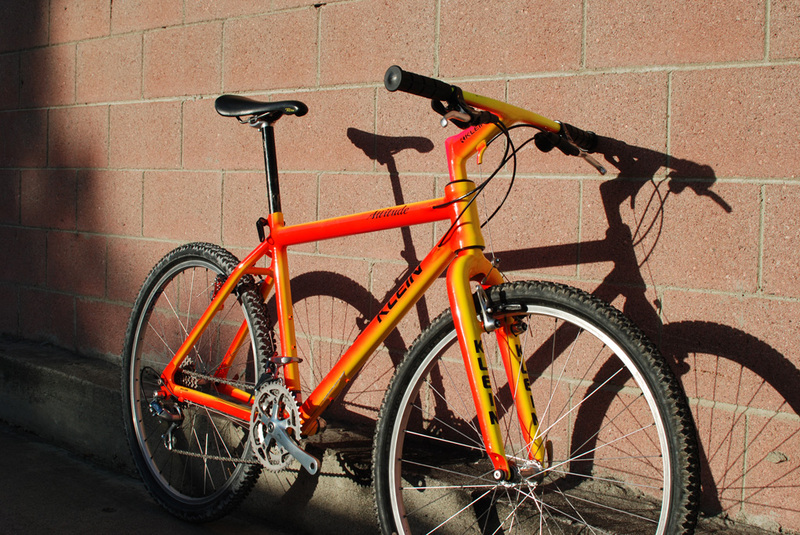 Basically frame, MC2 fork, some record OR cranks with a front and rear derailleur. The frame had a few chips on the headtube from some attempts at fork removal and installation, a couple small chips around the dropouts and maybe a few more little nicks here and there. Otherwise it was in great shape. It stayed this way for a long time as I looked for a Strata fork (in hindsight a fool's errand as this bike never would have had a strata, oh well). Along the way I helped to organize a little museum exhibit for Cannondales's homecoming celebration in 2001 and ran into Tinker at the event. He was gracious enough to sign the frame. He didn't have any memory of having a second bike, but for that matter he didn't have much of a memory of any of that stuff. He did end up sending me some unused Mag-21 lowers which are a pretty good (not perfect) match for some of the purple on the frame, so who knows. It took me another year if not longer until the bike was complete. 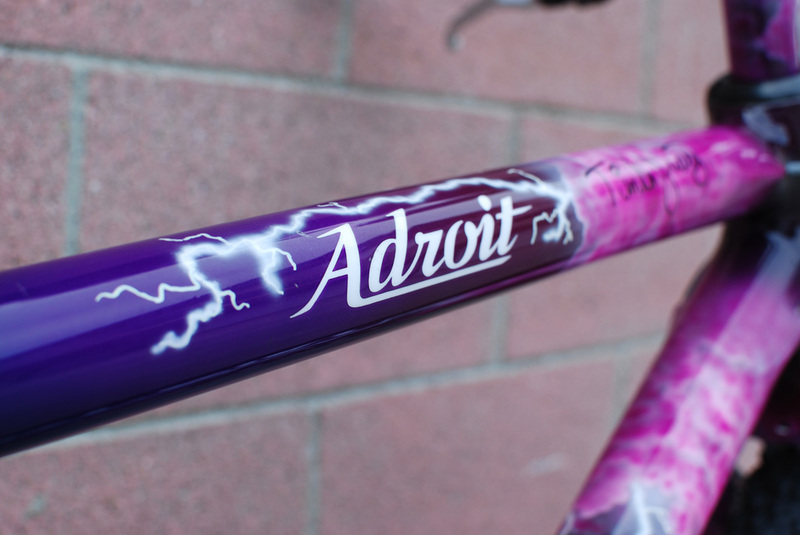 I found a Strata fork and MC1 and had them painted to <cough-cough> match the frame at CyclART. Along with that they touched up some of the chips and cleared Tink's signature. The rest of the build was a rather uninspiring (by today's standards) M900 XTR I took off of a NOS Specialized Epic Ultimate (which I then sold for OMFG - $300). I did manage to find (can't remember where anymore) a perfectly matching Mag-21 crown and a Klein post with actual Boron fibers inside the tube. That along with the full suite of jerseys, shorts, helmet etc and this is how the bike ended up back then in late 2002/2003. Not long after that I lost my job and ended up selling off my entire collection of bikes to stay afloat. One of the very last bikes to go was this one. It sold to a friend on mine in Denmark with the promise that if he decided to sell it he'd give me right of first refusal. I gave the bike a quick bath, it was covered in cobwebs (still some on hubs), adhesive tape residue and so on. It looks like it hadn't been ridden in over ten years. Basically the same as the day I built it 10+ years ago. Crazy!! So, what's next??? Well, I never liked the fork and MC1 and so they'll go. I will actually do the opposite of what everyone wants for their Adroit and remove the Strata and will install the fork I got from Tink and put on a more subtle MC1, either black or maroon/black. 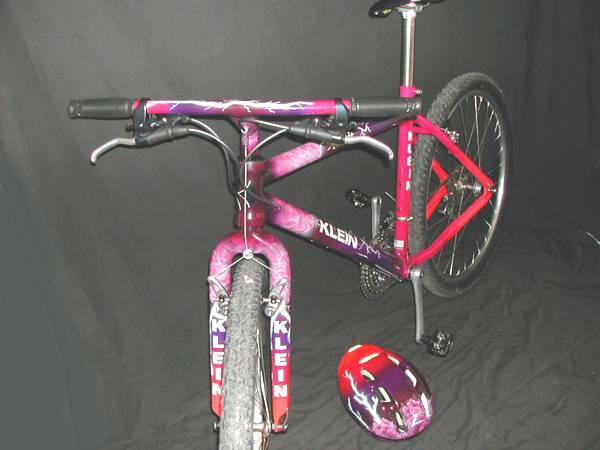 I will take a page from Kai's book and build the bike with the same/similar spec that Tinker had back in 93. I've got most of the stuff sitting here and just need to build the wheels and put it together. This is the last of the three DBMs that I've had the pleasure on work on. As far as the evolution of the design this frame (in my somewhat limited experience) represents close to the pinnacle of the design. 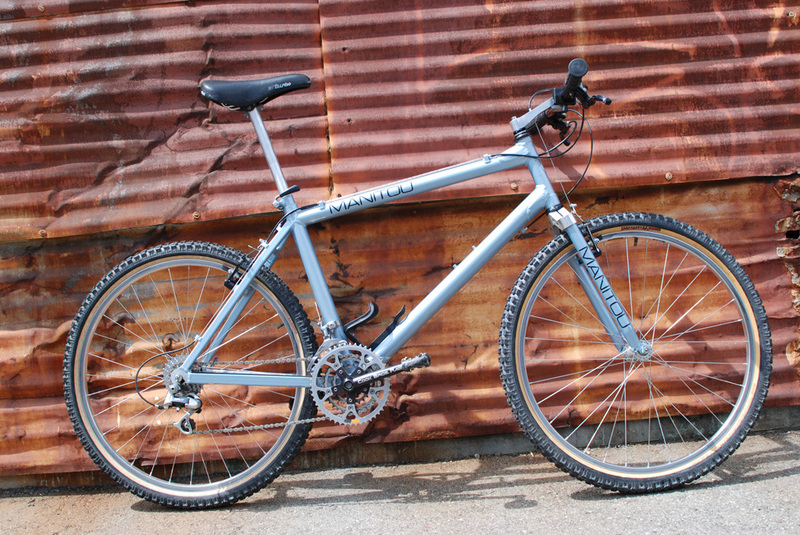 There were a few more changes in later years, but as far as I can tell they were limited to the frame accepting a 31.8mm seat post vs the 27.2 in this frame (26.8 in earlier years). Although I am very much partial to my 89 "Big Blue", something about this bike just screams "Go FAST!". I really like the look and am very happy with how it turned out. 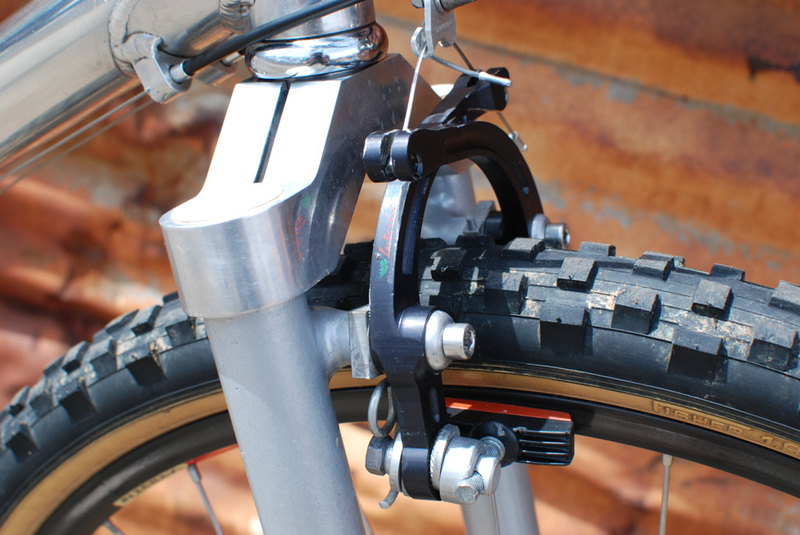 Maybe some Grafton brakes or Cook Cranks might spice it up a bit more, but all in all I think the balance here is great! Although each of the three DBMs presented here came with the first generation of the Manitou suspension fork I only built this one using the fork. It was a bit of a challenge, but in the end I was able to make some custom elastomers from a Manitou 4 and got it work pretty well. 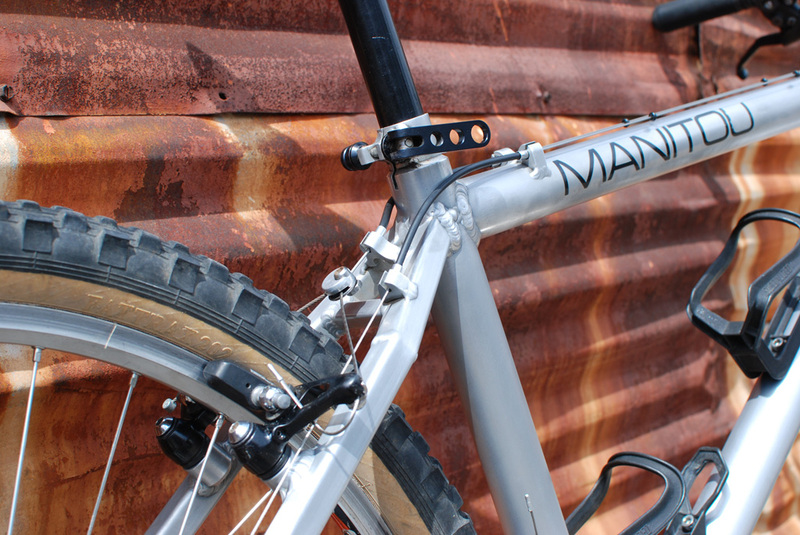 This fork represents the genesis of the widely known line of Manitou suspension forks. 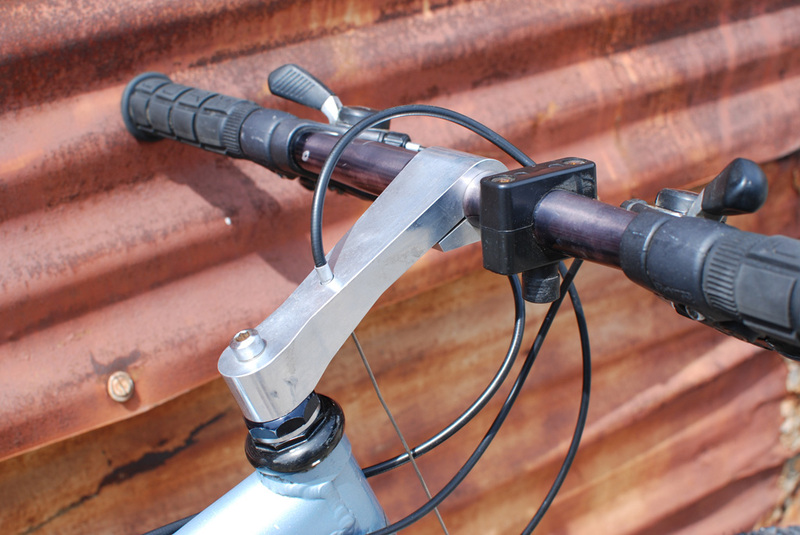 This is Doug's first design (identifiable by the diagonal dropouts) and features a whopping 1.25", maybe 1.5" of travel. Perhaps the travel is limited in this fork by my choice of elastomers, but I don't think so. Since this fork is made to go with this fram it's spaced out to accomodate the 115mm modified Hi-E hub, I imagine the forks that Doug made for Tomac and other racers back in the day were available and regular spacing as well. Like my 89 bike this frame uses the machined 3/8" Aluminum stock to connect the chainstay box section to the 90mm bottom bracket shell. A Cook Bros bottom bracket with a 135mm spindle neatly tucks into shell. 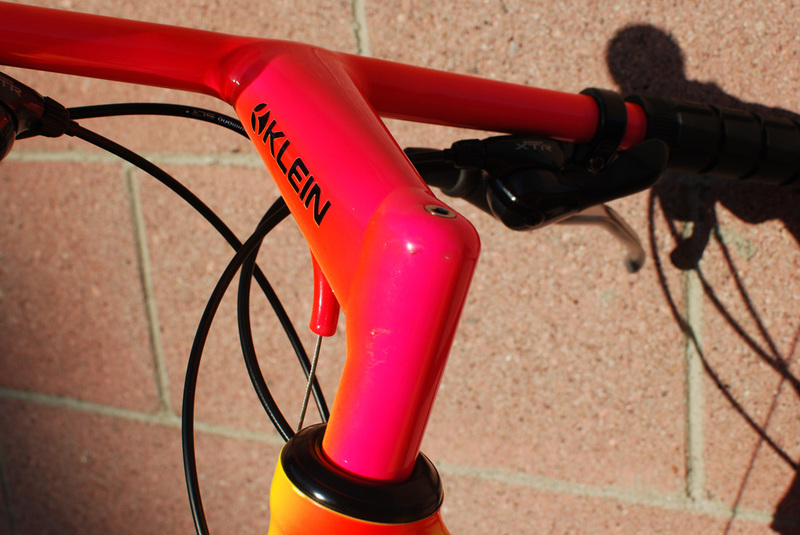 The shape of the top tube to head tube reinforcing gusset changed from the 88 to 89/90 frames. In the earlier frames the gusset was taller to accomodate the longer extension of the head tube above the top tube. 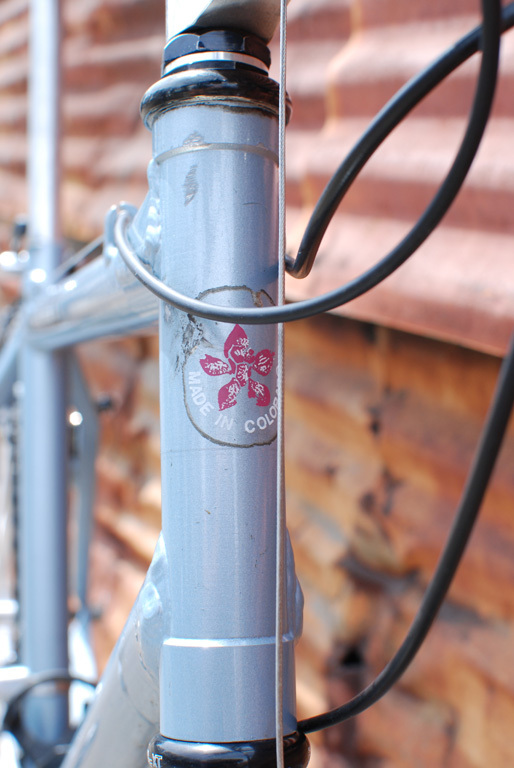 In the later frames the gusset grew longer along the top tube, but the overlap with the head tube was reduced. I'm not exactly sure as to how this change came about, all I can suggest is that Doug made some subtle changes to the geometry over the years which resulted in less overhang of the head tube above the top tube, and so a shorter gusset was sufficient to reinforce the joint. 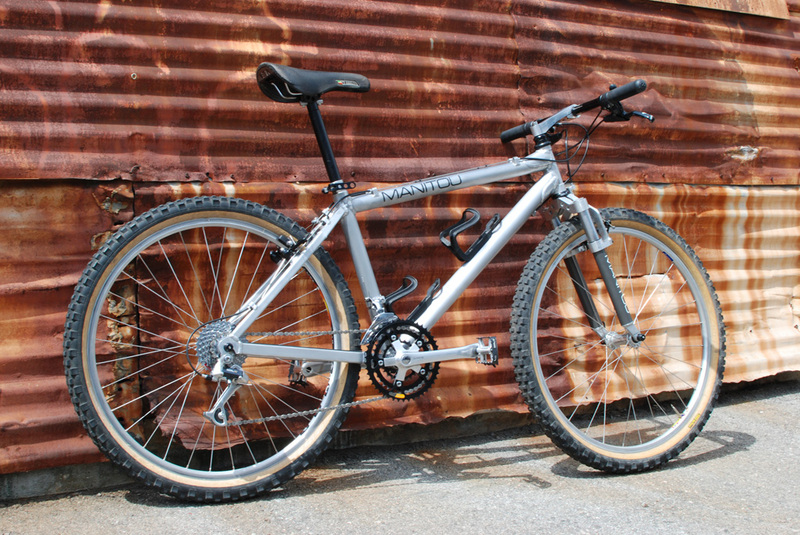 The rear end on this bike is the same as the 88 and 89, 0.75" box section for the seat stay and 1.0" box section for the chainstay connecting to a vertical dropout machined out of 3/8" aluminum plate. 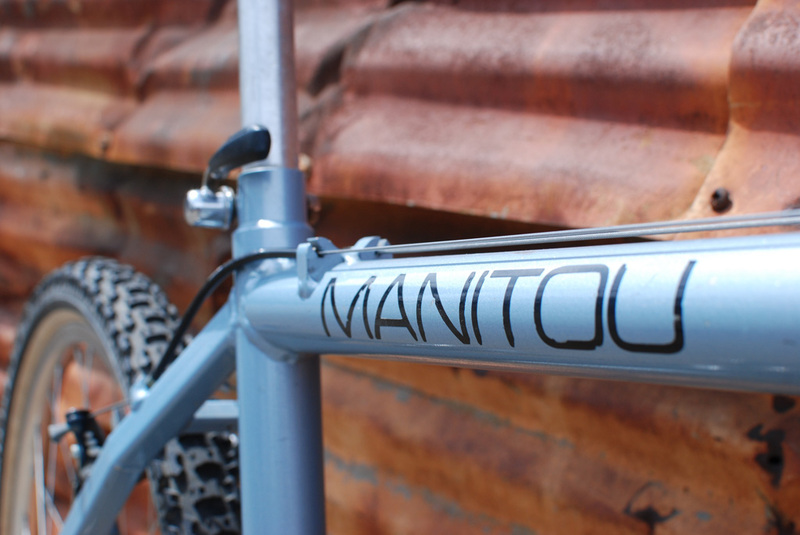 Definitely my favorite style / font used on the MANITOU decals. Well, not much more to say here. 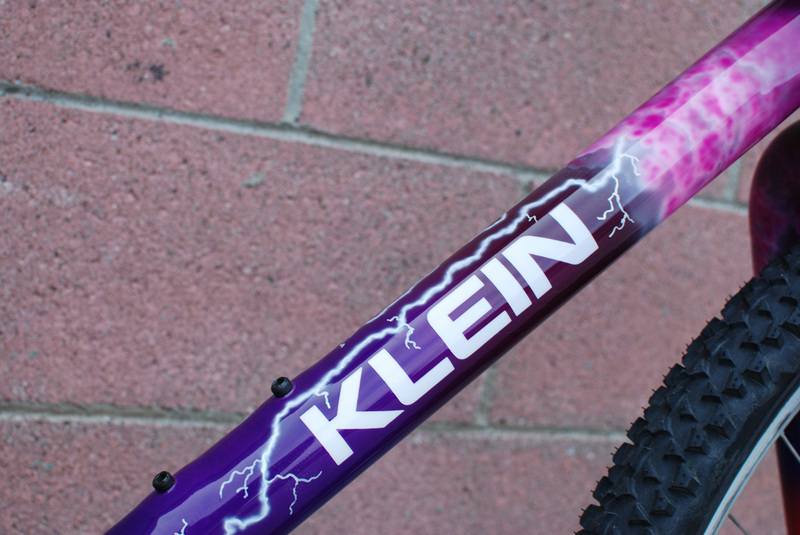 This is a killer bike that's once again ready to hit the trails!! Although I've shown this bike before I thought I'd take the opportunity to put some proper skinwall tires, a nice Turbo and clean it up for some nice pics. 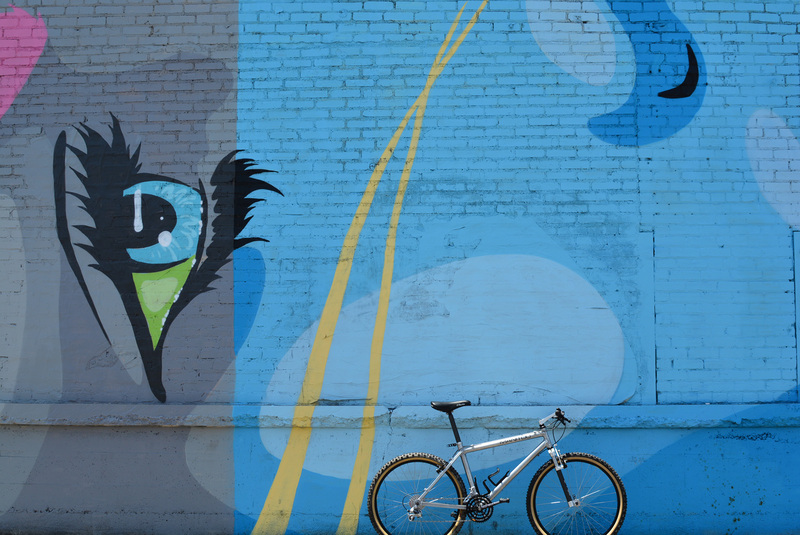 I've been riding this bike a fair amount lately and have really grown to appreciate it. All of the design characteristics that Doug listed requirements in the old MBAs and brochure are here. 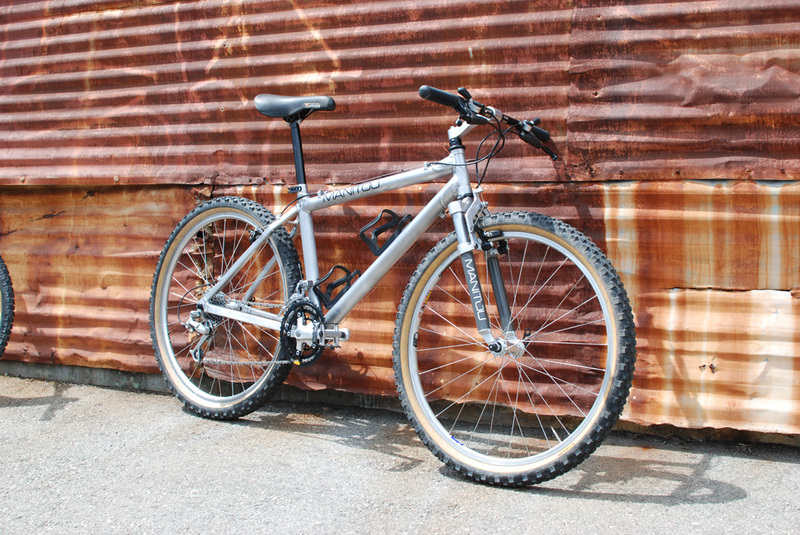 This bike is a capable climber, stable descender, has great turn in and a short enough wheelbase to negotiate the most technical of switchbacks while being stable on high speed fire roads. It's really a total package. 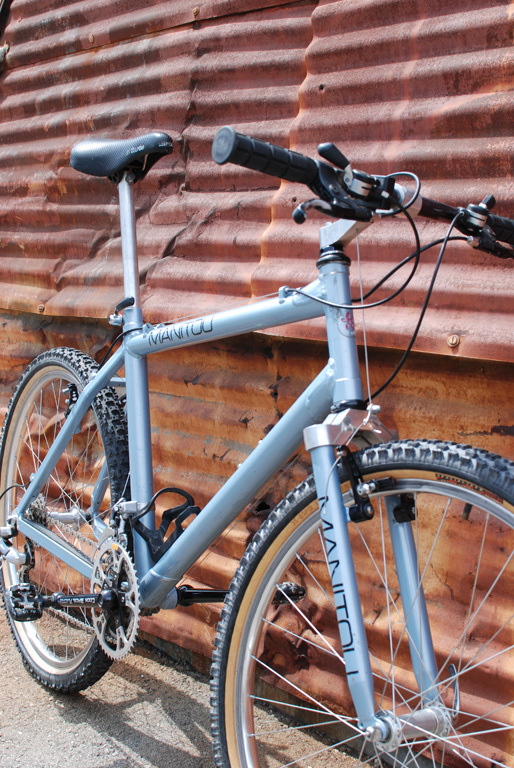 This bike shares many of the same design elements with the 1988 Manitou I featured earlier. 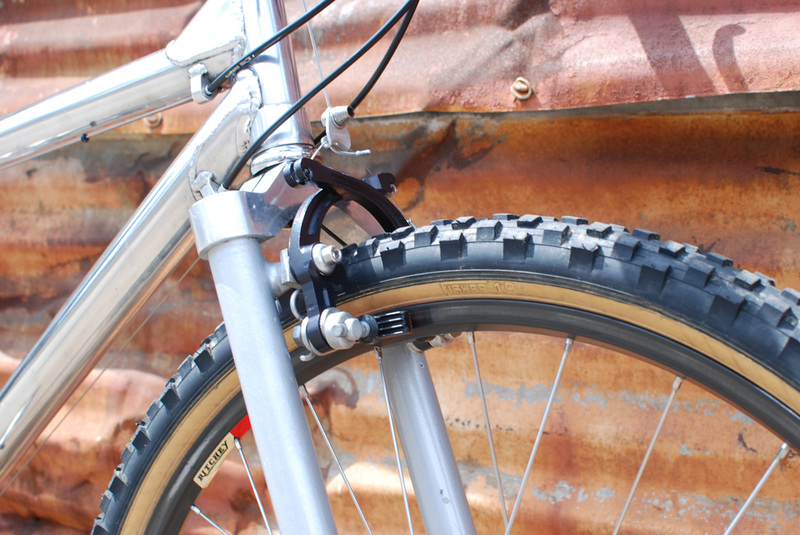 The main visible difference is the larger 1.5" seat tube as compared to the 1.25" on the 1988. 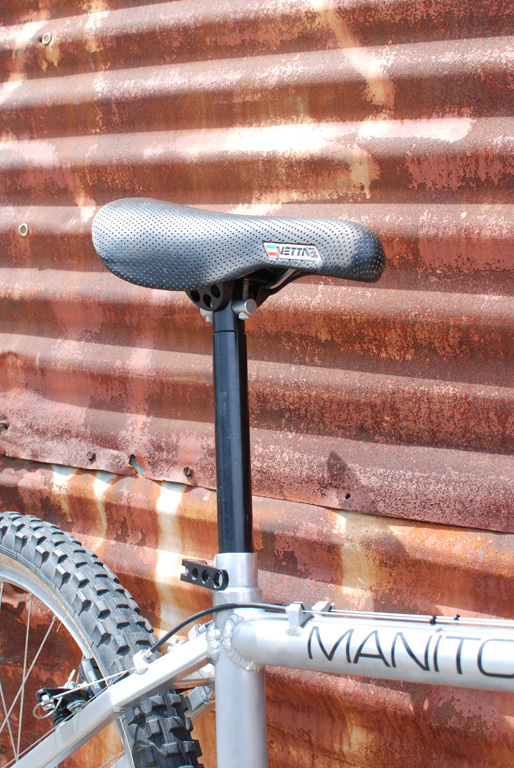 The seat tube necks down at the top to accomodate a 26.8mm seatpost just like the 1988. 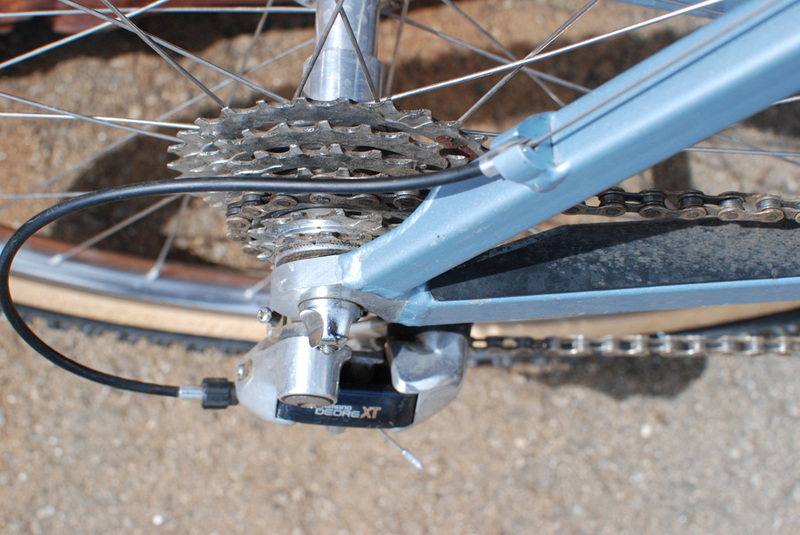 A custom front derailleur band clamp (Shimano didn't make anything over 1 3/8" at the time) is used to mount the XT front derailleur to the massive seat tube. It seems Doug used Aluminum for the early clamps, but later switched to steel as the Al versions seemd to fatigue and break. I've seen photos in one of the MBA reviews (late 1988 I think) that show a seat tube starting at 1.5" near the BB and then necking down to the 1.25" at the middle and up. This would be a transitional design element going from the 1988 to 1989. 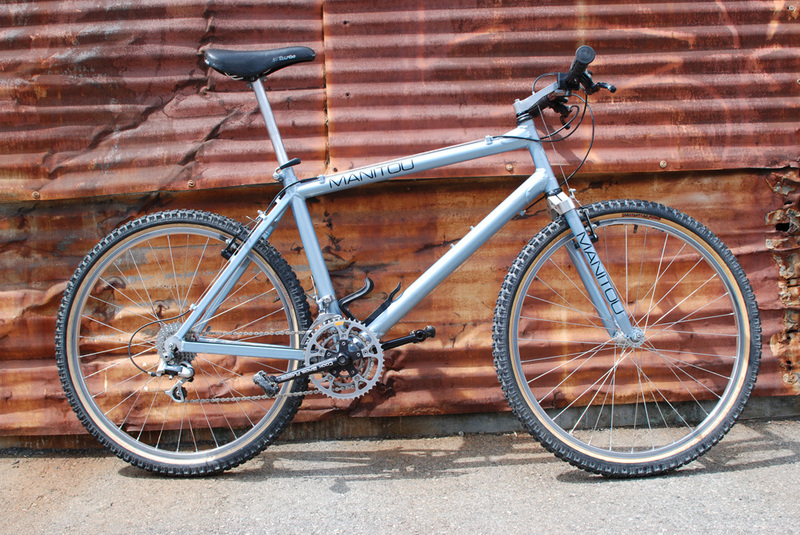 Although linking a specific feature on a DB Manitou to any given year is silly as he changed things as they suited him, it seem that the increasingly larger seat tube was a consistent feature going from 88 to 89 and onto 90. Eventually in 91/92 he started using 31.8mm seat posts and removed the neck down feature at the top of the seat tube altogether. As best as I can tell Manitou stems came on some 1988s but not all. My 88 is an early one and so it didn't get the stem, while some later ones I've seen did have them. 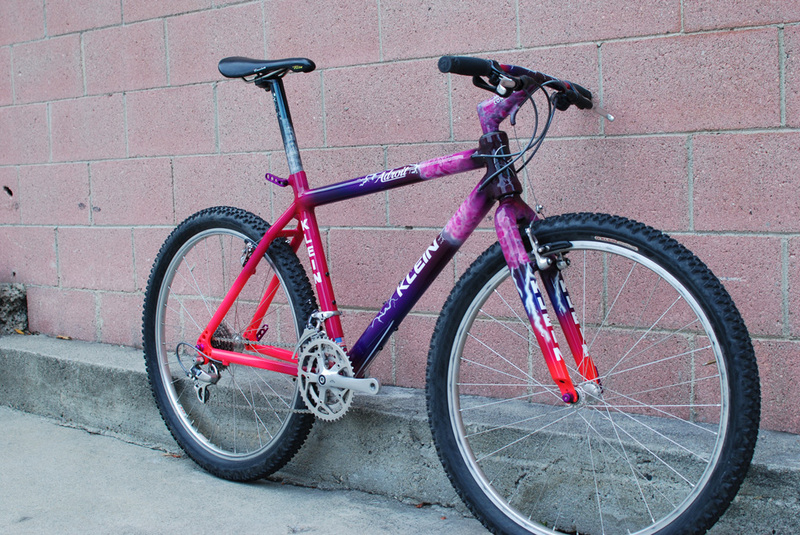 It appears that by 1989 all of them came equipped with the custom stems and this bike is no different. The stem really completes the custom kit for any DB Manitou and although simple in design is rather aesthetically pleasing to look at. 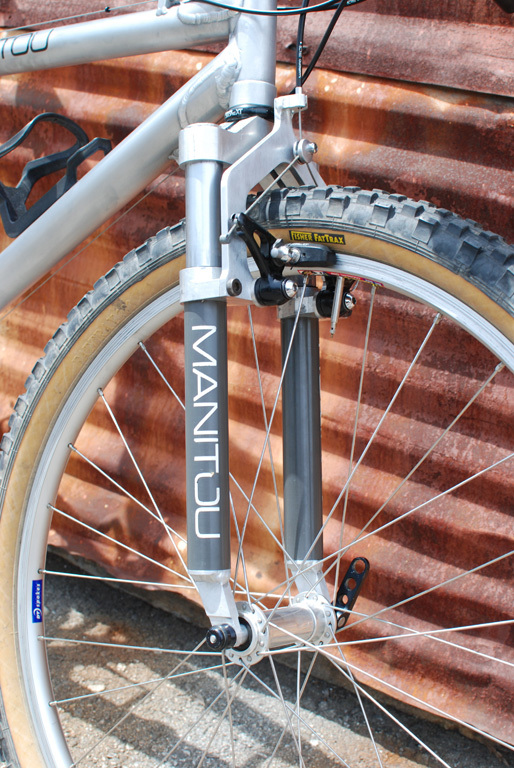 Unlike the 1988 frame which featured horizontal dropouts this 90 Manitou uses vertical dropouts, a design feature found on all subsequent Manitous. 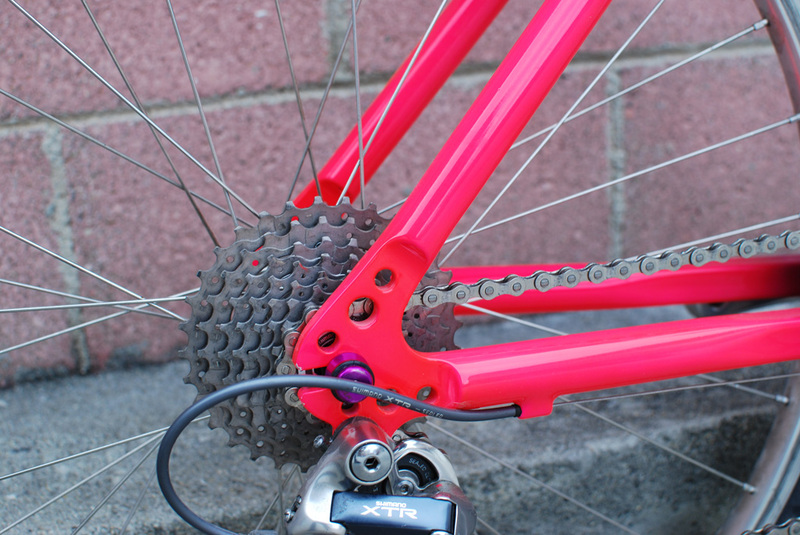 The rear end is basically the same, with the main point of departure being the way the chainstays are mounted to the BB shell. I need to go and take another picture to better depict the change, but suffice it to say where the 88 frame used a custom formed, asymmetrical 1" box section to offset the drive side chainstay around the tire the 90 uses a 3/8" Aluminum plate on both sides with a cross member to join the now symmetrical chainstays to the larger 90mm (vs 68mm) bottom bracket shell. 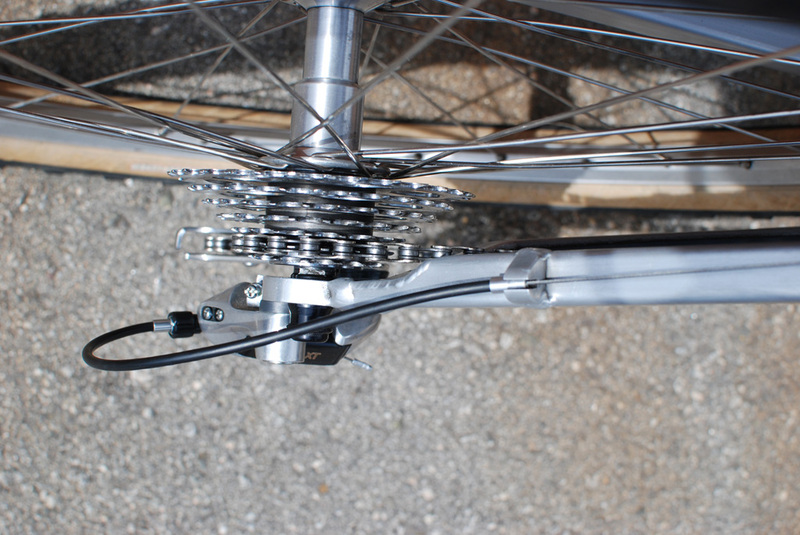 Other differences include the way the dropouts are mounted onto the fork legs. 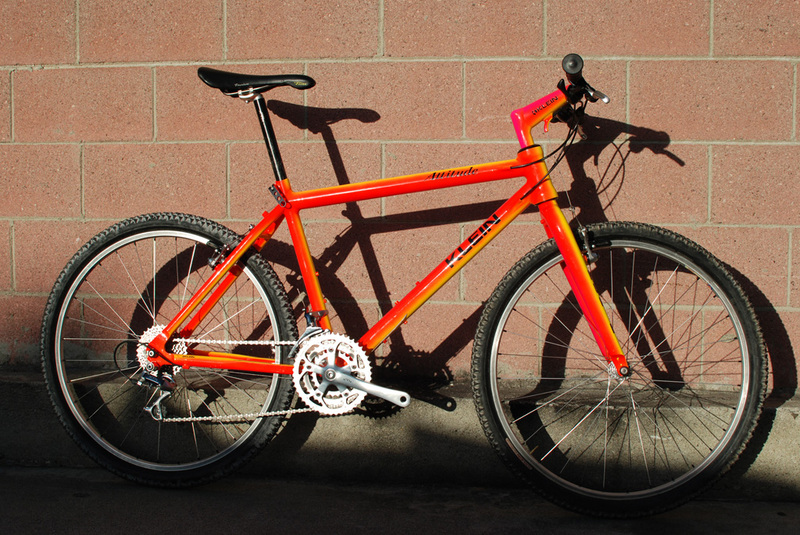 On the early 88 forks Doug simply pinched the steels legs together and then welded in the dropouts. On this 90 he formed the lower legs into a taper which serves as a much cleaner transition to the dropouts (will add photos later). 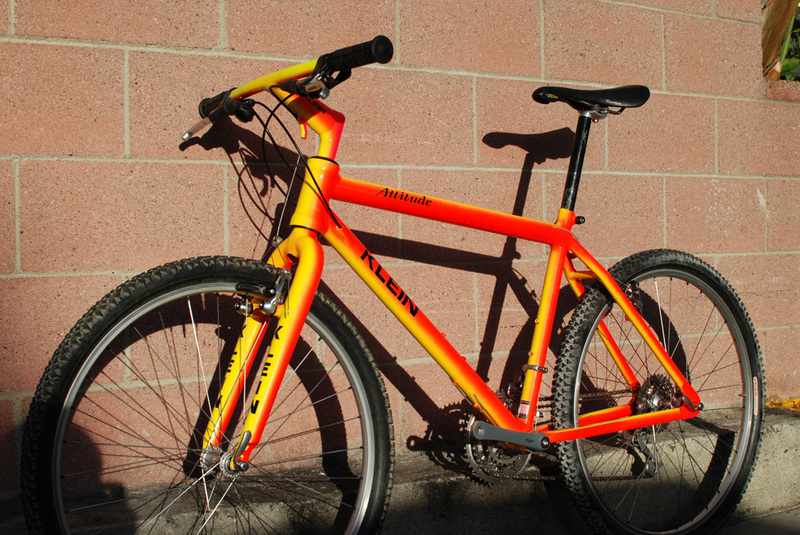 Lastly, one of the coolest things about this bike and the thing most people notice first is the color. Doug painted very few of his bikes and according to the previous owner this bike was one of maybe 10 that were painted for an order to Japan and Doug added this bike (which was sold to Los Angeles) as a favor. I've seen pictures of three or four of the other blue Manitous and actually one black one. But aside from those I have not come across any other painted Manitous, making this a rare bird. I just like the color. Finally finished rebuilding the 1988 Bradbury Manitou and went out for a quick photo shoot. Of the three DBMs I currently have this is by far my favorite. Sure it's too small for me and I can't ride it, but the transitional nature of the build is really interesting and I love the way the bike serves as the missing link between Doug's early efforts in 1986/87, which were rather similar to average bikes of the period (just made of Aluminum) and the later 90/91 bikes which were essentially production models. First things first, frame specs. I don't have an inclinometer to mesure the precise angles of the head and seat tubes, but the bike has an agressive feel to it, so my bet is they're somewhere in the low 70s. Unlike my 1989 and 1990 DBMs which are virtually identical this bike has a host of unique features, a true testament to the idea that Doug was experimenting with design elements along the way and some things stuck around while others were changed. 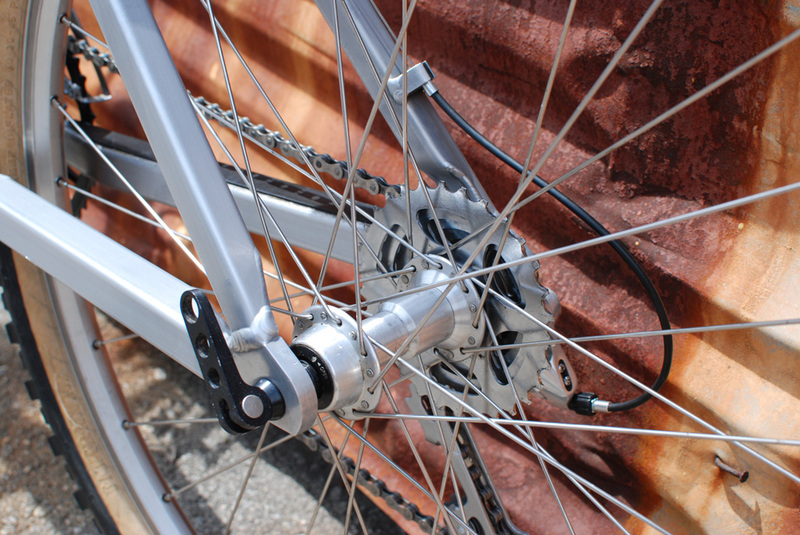 One of the neater features in my opinion is the design and construction of the chainstay to bottom bracket shell joint. On this early frame the non drive side chainstay is made out of a 2 piece 1" box section angled away from the BB shell to provide tire clearance. This bike came with Fisher Fattrax 1.9 tires which fit nicely, but I think running the same tire in a 2.2" version would be a stretch. 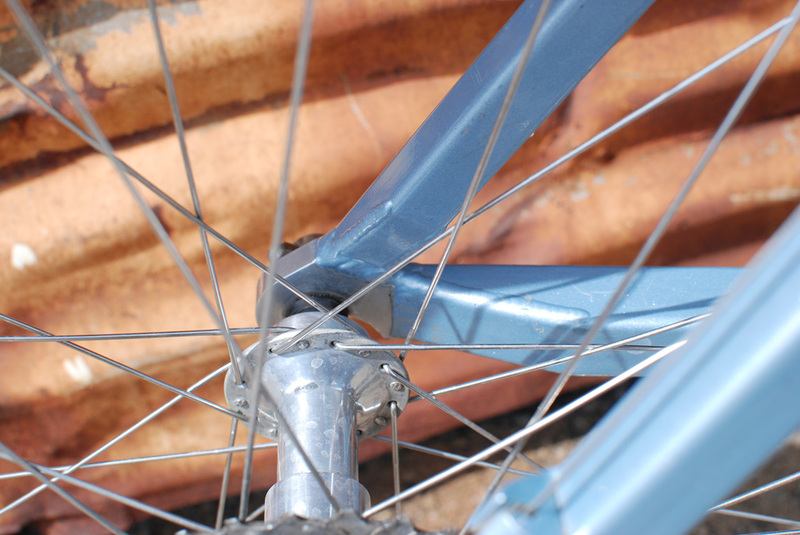 To provide tire clearance and align the chainline for the oversize rear hub drive side chainstay is shaved off to approximately 0.75" wide and angled. The later 89/90 frames used 3/8" Aluminum stock in lieu of the formed 1.0" section to join the main section of the stays to the BB shell. Also this frame lacks the horizontal cross member joining the two seatstays that is present on the later frames. 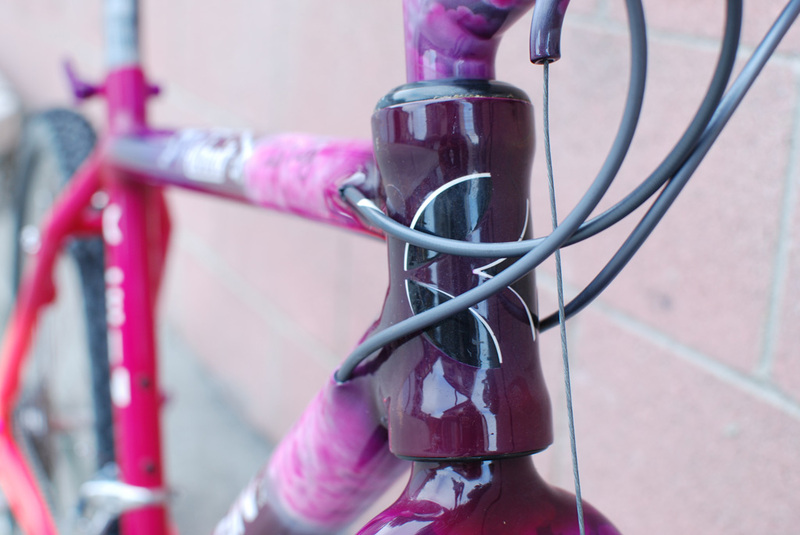 Couple more photos showing the details of the stays and the horizontal dropouts on this frame. 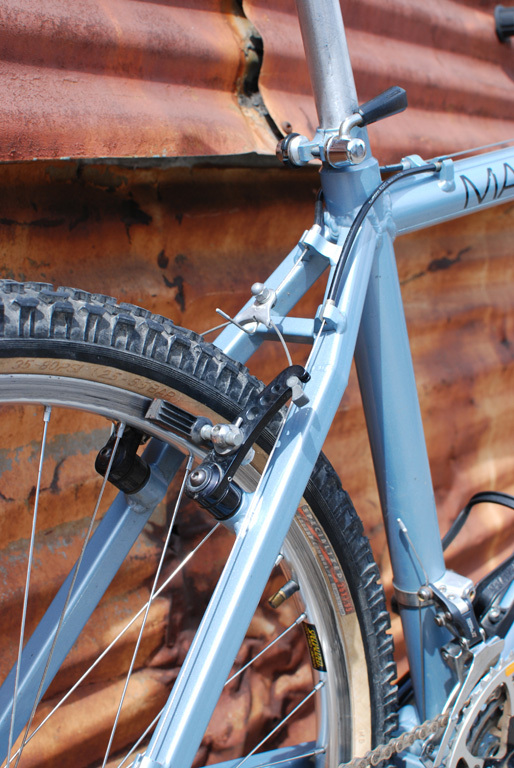 Unlike the 89 and 90 frames which run rear brake and rear derailleur cables along the top of the top tube the 88 runs the rear brake cable underneath the top tube and both the front and rear derailleur underneath the down tube. Due to the routing and size of the frame I had to trim down some housing ferrules to enable the cables to have a more relaxed bend and not push too much against the ferrules. Due to the frames small size not a lot of room is available for the straddle cable on the rear brake. The solution (as was the way back then) is a modified straddle cable hanger. 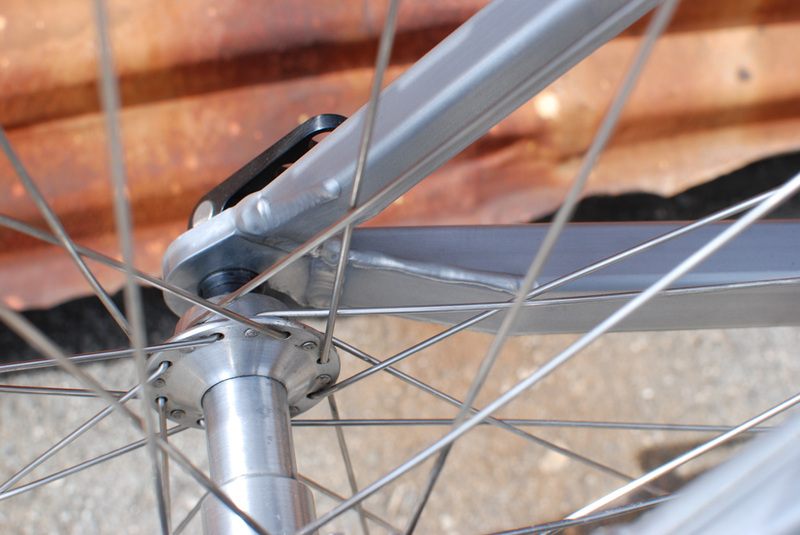 The top of the hanger was shaved off and the hole moved down closer to the bottom to allow for a shorter pull on the rear brake cable. I think the rear brake stiffener is a bit overkill in this application, but it does look the part! 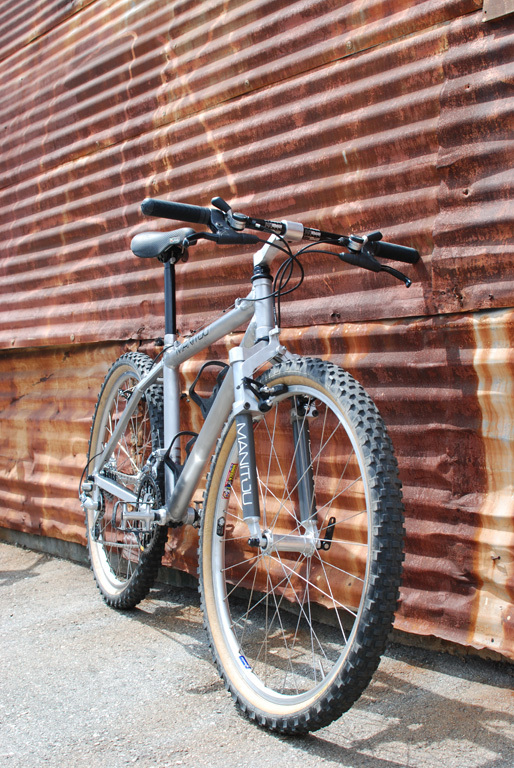 This bike has probably one of the early examples of Doug's composite Aluminum and Steel forks. 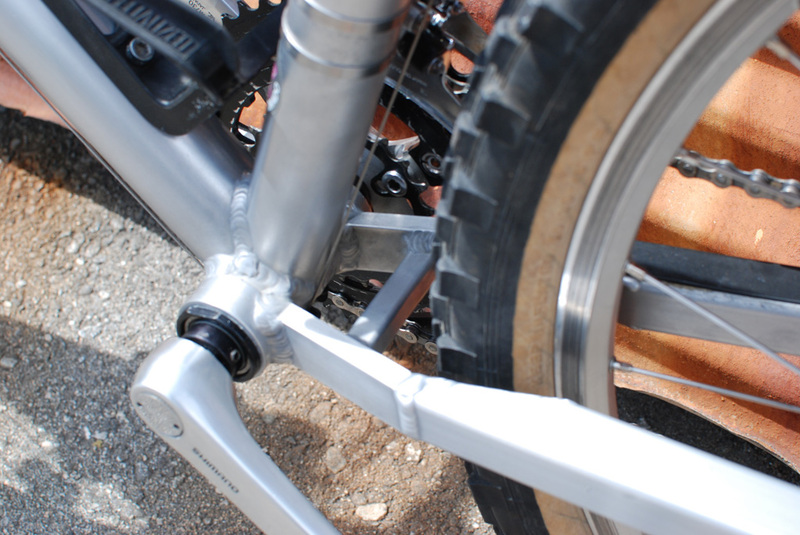 Using a bolt on Aluminum crown and 1.125" 4130 steel legs he was able to provide a fork both stiff and lightweight. The lower legs of the fork are pressed together to enable the attachment of the dropouts (I'll add a photo later on), this is rather unique and early attempt at this. By 1989 he seems to have improved the method and those later forks do not have the odds bulge at the bottom like this one. 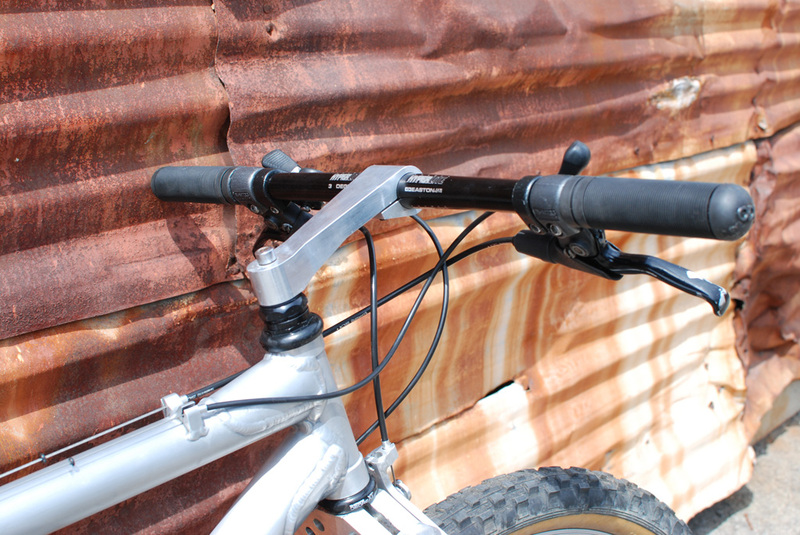 Although difficult to see this early fork uses plastic top caps instead of the later adopted Aluminum caps that became very common with the introduction of the Manitou suspension fork. In terms of the component spec this bike has just about the best that time period could offer. Cranks and Titanium bottom bracket courtesy of Cook Brothers (RSR cranks shown in photos will be swapped for period correct CBR cranks). IRD progressive u-brakes, seatpost and handlebar combined with a Ringle stem were some of the more exciting components back then. The Ringle stem was a 1989 feature and will most likely be swapped out for an original Manitou or maybe a matching IRD macaroni. Front and rear wheels are custom modified by Doug using an extended Hi-E front and XT rear hub to accomodate the wider spacing. 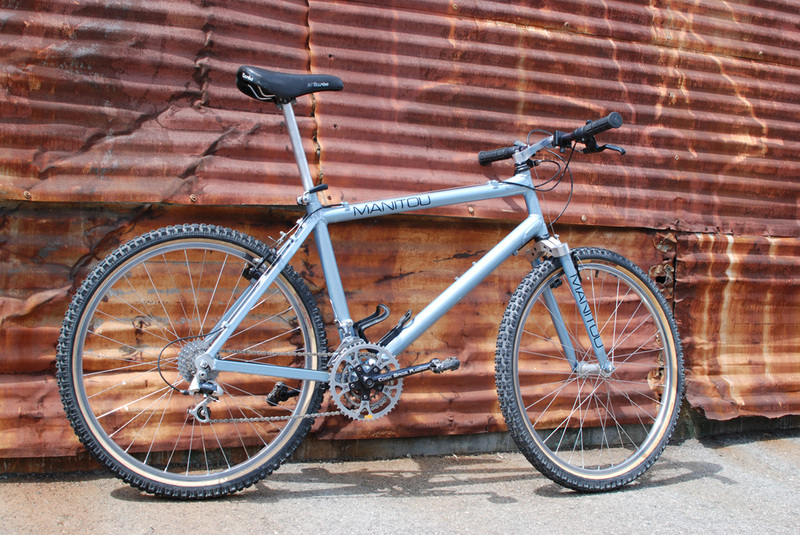 Rims are Ritchey Vantage Comp and tires are Fisher Fattrax 1.9 (sometimes called Slimtrax). 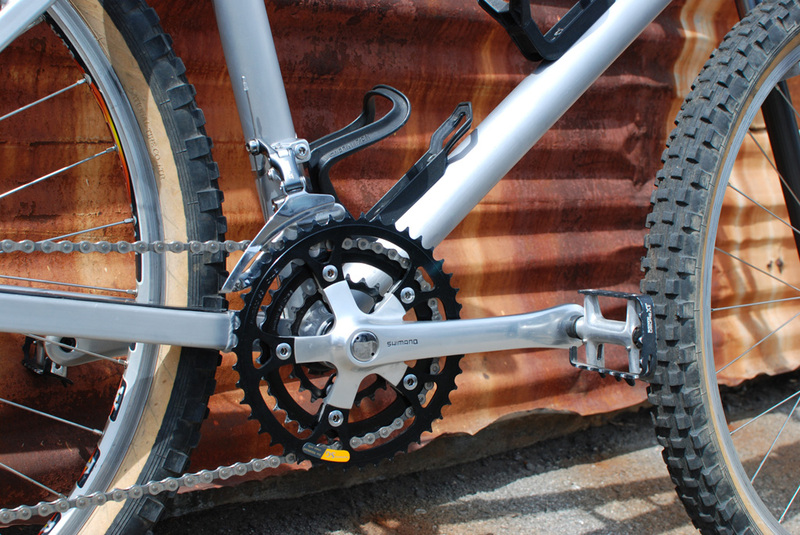 Drivetrain is mostly Shimano XT M730, however this bike got a tighter rear cluster and thus employed a Shimano EX600 rear derailleur to provide crisp rear shifting. Originally the bike was equipped with smaller front rings resulting in a sort of early micro-drive type setup. I replaced these with a more standard 48/36/24 spread, but this setup seems to require some adjustment to the chainline, so I may have to make a few more adjustments here. All in all the bike is a fantastic, it really must have a been a treat to bring this home back in 1988. 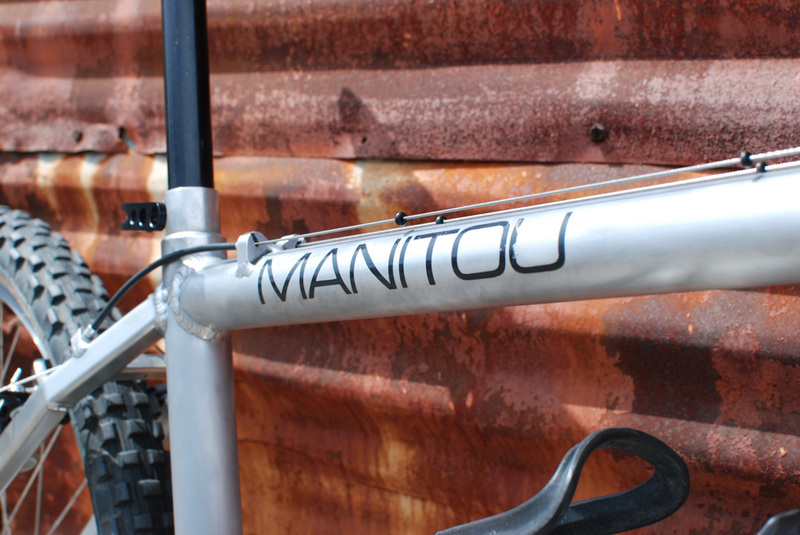 Unlike some of the later Manitous the finish on this frame is amazing even after all these years. The bike simply looks amazing and feels as good as anything else I've ridden from that time period. 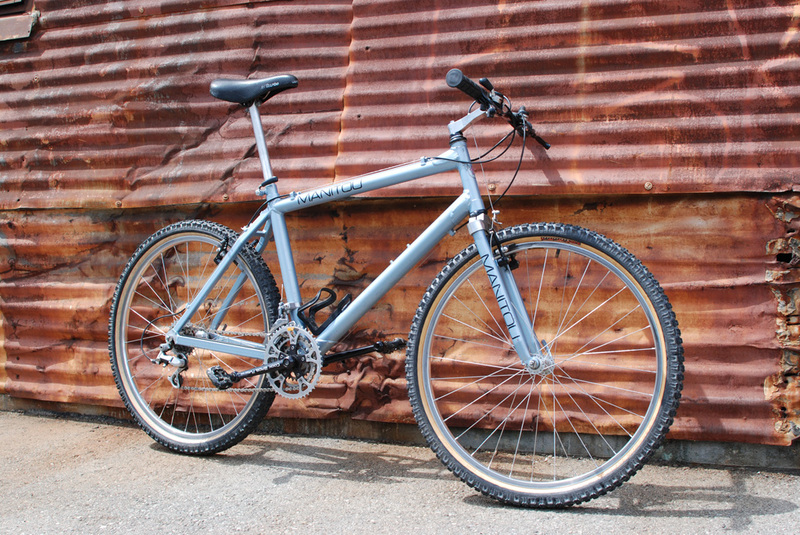 It's been a real pleasure restoring this frame and I hope it continues to see real trails for another 20+ years. Just wrapped up my turbo charged weekend of building bikes. That's about four bikes in three days and I have to say I'm beat, but feel accomplished. 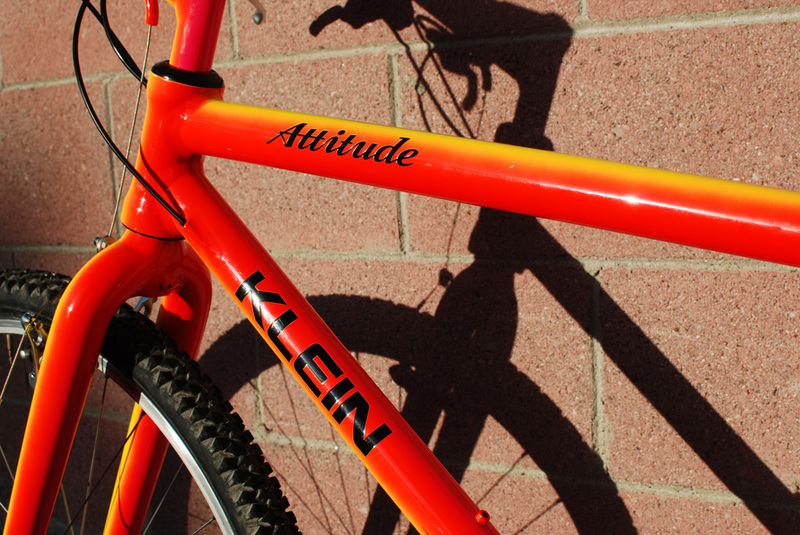 The last one in line was this 1992 Klein Attitude finished in Sunburst linear fade. 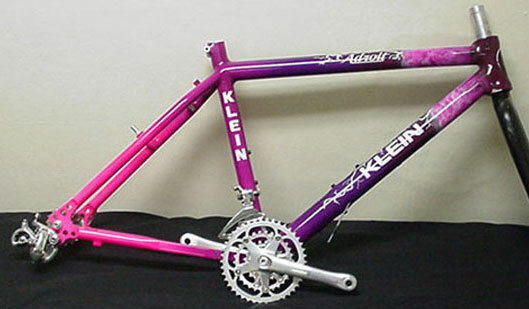 This is a 1992 frame but was painted by Klein in 1993, hence the debossed decals. The build here is pretty straightforward, just M900 XTR. I'll most likely add a Ti Syncros post and some Ringle QRs to add a little bit of flair, but mainly here the goal is to let the frame shine. It's so hard to capture the colors of these bike with a camera, the colors blend together so smoothly and remain so rich after all these years that even my DSLR fails to bring out their true richness and depth.